Very cool! I can hear the giggling now… My kids would LOVE this. Great way to put a twist on kids interviewing each other. I love your STEM idea! This combines communication, teamwork, and Science….perfection! On the first day of school, my students are given an IPOD template and are required to create a playlist that connect with various aspects of themselves. They don’t choose a song because they’d simply like it, it has to connect to so e aspect of themselves. For example, Umbrella could represent how they are a good friend to others. Thanks! I bet your students have lots of fun with the IPOD activity. Thanks for sharing! We used this activity on our parents’ night a few years ago to get all of the parents to interact and meet each other! I wish I had added the writing portion. Very cool! I never thought about having parents do this, but could see it being very interactive! Woohoo! I hope they have lots of fun getting to know each other! Love love love this! Thanks for sharing! 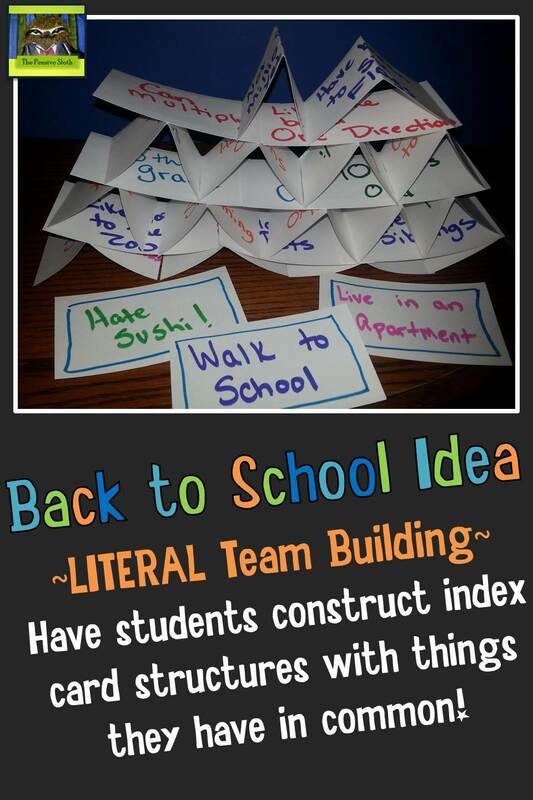 This is a great first day activity to get kids talking and working together. I love that it’s different than the usual get to know you activities! I love seeing the different ways the kiddos build the towers. Lots of problem solving! You are welcome! Have a great beginning of the year! Love the quiz idea for the first day of school. We do that often and the students really enjoy it! It’s lots of fun, for sure and the kids like to know their teachers are human! I love this idea! I’ve done a similar quiz activity before–the kids really get into it and they will remember those little facts all year! They certainly will! I still remember the times in elementary when my teachers let us get to know them a little. I had a 6th grade science teacher who used to play Garth Brooks songs on his guitar and sing for us on party days and my 3rd grade teacher had scorpions in her apartment. Ahhh…memories! What a great activity! I hope to use it this year. Thanks! If you do, stop back in and let me know how it goes! Definitely want to use the index card team-building activity. I can picture a little frustration until they realize how to work together to find things in common. Thank you for the idea!